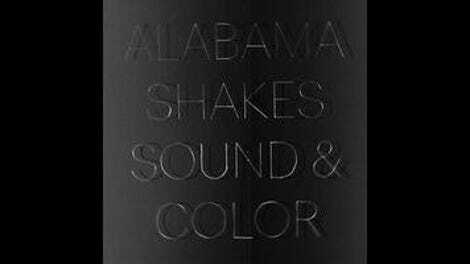 Alabama Shakes’ 2012 debut had a signature hit in “Hold On,” followed by 10 more well-executed songs that kept the vintage rock ’n’ soul party going strong. The band’s follow-up breaks from that formula from the first note, as frontwoman Brittany Howard (guitar and vocals), Zac Cockrell (bass), Steve Johnson (drums), and Heath Fogg (guitar) play through 12 tracks that branch out toward slow-burn R&B, pell-mell garage, trippy guitar excursions, and in-the-pocket funk. Expansive but scattered, Sound & Color is the sound of a band consciously avoiding playing to its known strengths while seeking to establish a whole new slate of powers. Sound & Color starts with the ethereal title track, a slow drip of a tune that grows from chiming vibraphone notes to add a lush string arrangement, serving as the backdrop for Howard’s yearning, dreamy repetition of “sound and color.” It’s a statement-of-purpose sort of curveball, the band clearly asserting this album’s independence from its predecessor. In contrast, Boys & Girls opened with the band’s tightest and most instantly memorable tune, which was also Rolling Stone’s top song of 2012. Where “Hold On” is laden with rock ’n’ soul vibrancy, “Sound & Color” is table-setting mood music, as unexpected as it is layered and beautiful. The first single from Sound & Color follows, with the punchy funk of “Don’t Wanna Fight” given an additional kick from the slower setup. This time, it’s guitar muscle that frames Howard’s vocals, the intertwining parts playing against each other in a natural contrast as the rhythm section keeps the song bounding forward. “Dunes” and “Future People” continue the first half’s run of spacey funk, drawing on the influences Howard cites in the album’s publicity material: Super Fly, Gil Scott-Heron, and the psychedelic soul of ’70s Temptations. Guided in the studio by co-producer Blake Mills, the sound of the album is a distinct step forward from the relatively lo-fi Boys & Girls. The album’s downtempo tunes, “This Feeling,” “Guess Who,” “Gemini,” and the closer, “Over My Head,” put a particular emphasis on tone, atmosphere, and the carefully crafted smaller details. Yet none have the immediacy and charm of Boys & Girls. In the midst of the more deliberately arranged songs, the faster ones stand out even more: “The Greatest” is a burst of fuzzed-out guitars and a rhythm section that revels in getting rowdy for a bit, while “Shoegaze” leans back toward Alabama Shakes’ bluesy rock foundation. Boys & Girls grabbed 40 years of tradition and carried it right up to the present; it’s a spirited record of raw Southern rock, full of soul swagger and blues feeling. Sound & Color drops some of that urgency in favor of a hefty dose of experimentation, and while the results are intriguing, the record can’t help but meander a bit. Still, more than the thrilling and infectious debut, it’s the not entirely successful second record that’s most indicative of the band’s staying power. Going in different directions—even too many at once—proves that Alabama Shakes have the fearlessness and skill of a band with much more to say.